The Jackdaw – Do you feel patronised? Crossing the centre of Manchester recently heading for the match, an old friend asked me to step inside a handsome Victorian mill considered the Medici Palace of Cottonopolis. He’d worked on the conversion of this pile years before and hadn’t forgotten the impression a particular bronze made on him as he entered the building each morning. Although he admits to knowing nothing about art no one needed to tell him this statue was remarkable. He could see it and feel it for himself. It had left its mark. Between the grand arched entrance, so typical of quattrocento Florentine palazzi, and the high lobby are matching shrines hidden from the street. On the right is the domineering silhouette of a figure instantly recognisable to fans like myself as Charles Sargeant Jagger’s The Sentry. This was a most pleasant surprise. There’s no mistaking the gravity of an encounter with Jagger’s work, recognition is immediate, the signature unique. His pieces celebrate the staunch resolve and dignity of ordinary blokes. I tried to locate this piece decades ago but never managed to see it, the building having for years been boarded up. Surviving calls from rapacious developers for its demolition, the 1856 edifice eventually reopened in 1982 as the Britannia Hotel, since when its ground floor bars and cafés have become popular night haunts. In the matching chapel opposite the imposing figure are inscribed in granite the names of 87 employees of S and J Watts, the wholesale haberdashers for whom the mill had originally been built, who had been killed in the Great War. Erected in 1921 the sculpture was among Jagger’s first commissions following the delayed start to his career caused by his own exemplary military service. Though undeniably impressive few of those entering the complex will notice the sculpture. They are probably too eager to avail themselves of, among other thrills awaiting, a ‘Happy Hour’ offer of two pizzas and two pints for fifteen quid, the advertising board for which stands a few feet from Jagger’s plinth. Eight years ago the bayonet was hacked off in a drunken prank and has never been replaced despite this being an important detail of a Grade II* listed work. To check on the original appearance including bayonet (the maquette is inset opposite), there are reduced versions in Liverpool’s Walker Art Gallery, at Eltham Palace in south-east London (Stephen Courtauld, who lived there, was a fellow officer with Jagger in the Royal Worcesters and, coincidentally, it was his family’s textile firm which eventually bought the Watts building), and in the museum at Rotherham where Jagger was born, the son of a colliery manager. Exactly 100 years ago, Jagger (1886-1938), who had on declaration of war instantly volunteered with the Artists Rifles, arrived back in England from Gallipoli via a Malta hospital having been shot through the shoulder, a potentially disastrous injury for a carver and modeller. But Charles recovered quickly and was re-posted to the Western Front where, in April 1918 during the German Spring offensive, he was sniped through the chest two inches above his heart. Astonishingly, he survived and was awarded an MC for conspicuous bravery. This wound undoubtedly contributed to a cruelly early death due to heart failure accelerated by overwork. When the war ended he took up the Rome Scholarship won before the outbreak when graduating from the RCA. Recommended by George Frampton, he was soon making war memorials, a job for which, given his experiences, no one could have been better qualified. 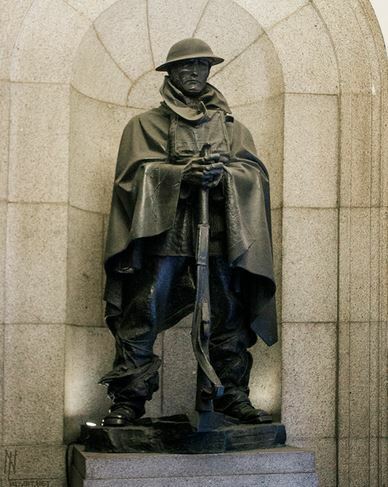 Jagger famously said: “I got to love the Tommy in the Trenches and I’ve tried to show him as I knew him – not as he looked on parade at home.” The caped sentry’s legs are protectively swaddled in sack cloth against the cold and wet, an informal addition to uniform permitted during frontline duty. Meanwhile, Roger Fry, who was always proud to know better than anyone else and who had already established himself as chief standard bearer for the avant garde, wrote of Jagger’s figure: “Nothing approaches the commonness, the effective, brutal, catch-penny vulgarity of his work”. Fry and his fixer followers won the subsequent taste war hands down. Jagger, Ledward, Frampton were forgotten, their works neglected, even wantonly ruined in the case of Jagger’s Unilever carvings. Understanding how the Establishment operated Fry was the first of a breed – today totally victorious – whose addiction to artistic novelty, whatever character it takes, is all and absolute. He was the first to proclaim loudly his low opinion of everything traditional, a view which eventually became so uncritically accepted as to become a basic qualification for anyone seeking preferment in the visual arts – Fry is the Vito Corleone of State Art. Those who refused to follow where Fry, Clark, Keynes and Co. led were dismissed as so many reactionary simpletons. To be an apostle of the avant garde was to be right – no argument. Thus, Fry’s heirs have learnt over decades of ascendancy to assume a patronising aesthetic and intellectual superiority over the rest of us. They treat us like blind children who are too thick to learn the big secret to which they themselves, alone, exclusively, enjoy special privileged access and insight. All I would ask is that you look for yourselves and are not cowed by those claiming to know best. Because they don’t. Perhaps Manchester’s Jagger really is vulgar, meritless and pedestrian. 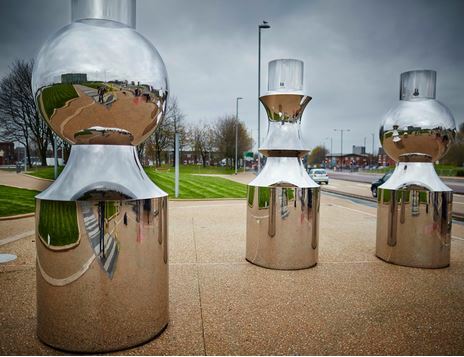 And perhaps Ryan Gander’s reflective bollards are, truly, “a world masterpiece”. What do you think? Leaving Jagger behind, as chance would have it our route to the ground took us past Gander’s chromium cruet. (It was a very cultural evening.) “What do you make of that?”, I enquired casually. “What’s it for?”, my friend asked.